What is a color palette? How to create a color palette? Where can I set up a color palette for fonts/cliparts/sticker background? A color palette in Product designer means a category for colors. You can create any number of color palettes and add colors to them. You create color palettes for your comfort, and you can set up a certain color palette for cliparts (to change color of cliparts), fonts (to change text color) and sticker background (to change background color in the "Sticker" mode) for a certain product. In the admin panel, go to Content -> Product designer -> click "Color palettes" in the left hand menu (demo.alt-team.com/admin.php?dispatch=product_designer.color_palettes). On this page you can edit/delete color palettes and choose a color palette status (Active or Disabled). Name - The name of your color palette (for example, you can create a color palette with the name "Basic colors" - for such basic colors as white, black, green, blue, etc., or "Art colors" - for non standard colors such as powderblue, rosybrown, peru, indigo, etc.). Position - The order of displaying (position of the color palette relatively to the position of the other color palettes). Status - Active - color palette will be available to work with; Disabled - unavailable to work with. Press Create button to create a color palette. Once a color palette/color palettes is/are created, add colors to your palettes. Colors are specified as an RGB triplet in hexadecimal format. In the admin panel, go to Content -> Product designer -> click "Colors" in the left hand menu (demo.alt-team.com/admin.php?dispatch=product_designer.colors) On this page you can edit/delete colors and choose a color status (Active or Disabled). Name - The name of the color you are creating. Color - Click the color button and select the color. Color palettes - Your created color palettes will be displayed here. Tick color palettes to which you would like to assign this color. Position - The order of displaying. Status - Active - the color will be visible to users; Disabled - the color will not be visible. Press Create button to create the color. If you have already created a product for personalization, you can set up a color palette for fonts, cliparts and sticker background. You can set up one of your created color palettes in Product designer tools display panel. Font color - you can choose one of your created color palettes from the drop down list which is located next to "Font color". Colors from a chosen palette will be available for the changing of a font color. Clipart color - click "Add art" tab on the Product designer tools panel and you will see "Clipart color" element. 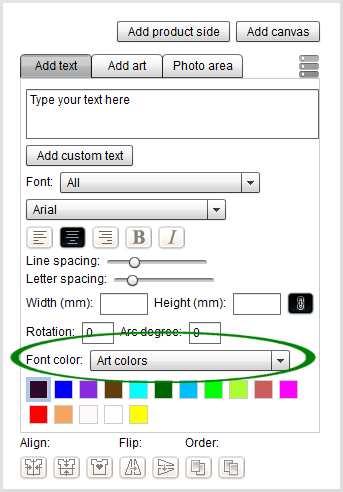 Choose the necessary color palette from the drop down list and you/customers will be able to change a clipart color using colors from a chosen palette. Background color - this element appears in "Add text" tab if the "Sticker" mode is chosen. Choose the necessary color palette and you/customers will be able to change a sticker background color using colors from a chosen palette.